The welcome that the Spanish painter Joaquín Sorolla y Bastida received in the U.S. was as warm as the light in his pictures. Joaquín Sorolla y Bastida, Valencia Beach: Morning Light, oil on canvas, 1908. 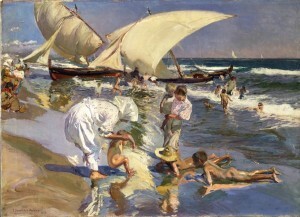 Joaquín Sorolla y Bastida, The White Boat, 1905, oil on canvas. Joaquín Sorolla y Bastida, Running Along the Beach, 1908, oil on canvas. 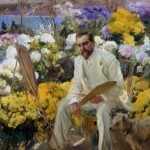 Joaquín Sorolla y Bastida, Portrait of Louis Comfort Tiffany, 1911, oil on canvas. The title “Sorolla and America” might convey the idea that the exhibition—on view at the San Diego Museum of Art through August 26—is a relatively narrow one dedicated to a slice of the Spanish artist’s body of work. But that would be incorrect. It is actually a massive loan show that reveals the full range of the Belle Epoque master’s painterly powers and is by no means confined to depictions of America and Americans. And that makes complete sense in the historical context. While Joaquín Sorolla y Bastida was a deeply Spanish artist, his relationship to the United States was also deep and, in economic terms, hugely important to his career. His two biggest patrons, the millionaires Archer Milton Huntington and Thomas Fortune Ryan, were American. Sorolla visited the U.S. only twice, in 1909 and 1911, but the blockbuster shows Huntington organized for him on those occasions cemented his international reputation. Often mentioned in the same breath with his friends, the American expatriate painter John Singer Sargent and the Swedish painter Anders Zorn, Sorolla belonged to no formal school. He eschewed modernist innovation in favor of total mastery of traditional paint handling and an inwardly motivated search for those subjects that satisfied him. When pressed to describe his own style, he used the term “impressionist,” which, despite his admiration for Monet, had a broader significance for him than simply the recent French school of optical experimentation. Sorolla insisted that his 17th-century countryman Diego Velázquez, usually considered a Baroque painter, was “the first, the supreme impressionist.” Speaking of the American artists he admired, including Sargent and William Merritt Chase, he said that he considered them all “children of Velázquez, like myself.” Sorolla had begun immersing himself in Velázquez’s paintings as early as 1881, when he saw them in the Prado in Madrid as an 18-year-old fresh out of the Escuela de Bellas Artes in Valencia. The first paintings Sorolla exhibited in Madrid, also in 1881, were seascapes, and to this day he is best known for his dazzling depictions of sun and sea. The beaches of his native region of Valencia, on Spain’s Mediterranean coast, were the settings for his most characteristic and successful paintings, such as Beach of Valencia by Morning Light (1908), which was acquired by Huntington for the Hispanic Society of America, the museum he founded, during Sorolla’s 1909 New York show. In this crowded, dynamic, yet somehow serene composition, four figures play at the water’s edge, the two young women holding babies and the two younger, skinny boys sprawled on their bellies, naked except for the straw hat on one of them. In the middle distance, another bunch of kids is running through the surf toward two boats whose sails billow outward at opposite angles. The illumination, by direct sunlight from a cloudless sky, is the sort that would overwhelm a camera, but the effect here is anything but blitzed-out; we get a glowing, golden light that brings out rich colors in everything it touches—the glistening, variously colored skin of the children; the deep, bluish-gray ocean; the touches of green that show through the sand; the red paint on the boats; and the sky itself, which the artist has rendered with a generous helping of purple paint where it meets the sea. The foreground is rich in reflections, rendered with just a few well-placed brushstrokes. The figures of the two boys are redoubled on shimmering, calm water, while one of the sails is mirrored on a swell that is just big enough to distort the shape of the sail with its curvature but not enough of a wave to obliterate the reflection with white foam. 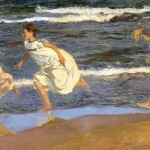 Exuberant children appear in many of Sorolla’s beach pictures. In Running Along the Beach, also from 1908, a boy, again naked, chases two girls in sun dresses, one pale pink and one white. The sun glistens against skin, and the bright sun draws crisp shadows in the folds of the cotton dresses. In The White Boat (1905), two boys hang from the hull by a rope, and the lower body of one of them appears dyed blue by the translucent water. In the more lyrical beach paintings, such as Going for a Bath, Valencia and After the Bath, both from 1908, Sorolla’s brush lingers over the Classical forms of adolescent girls draped in graceful garments and sheltered by shadows. In another seaside painting, Lighthouse Walk at Biarritz (1906), Sorolla shows more decorous—certainly more inhibited—adults, keeping their feet dry as they stroll on a cliff path above the beach. Here the female figures are all long white dresses and big hats, faces hardly discernible, forming a tableau of pre-World War I bourgeois grace. One Sorolla beach scene stands out from all the rest and points to another direction his art might have taken. Sad Inheritance (1899) depicts what at first glance appears to be the usual crowd of fun-loving kids, but on closer examination it becomes clear that they are all disabled, either physically or mentally. A black-robed priest supervises them as they enjoy what is likely a rare interlude of fresh air away from the hospital where they live. The emaciated, distorted bodies of the shaven-headed children, some of whom are on crutches, look painfully exposed, and in this painting nakedness comes across as poignant rather than as a sign of uninhibited joy or immersion in nature. The artist based it on a scene he had actually witnessed, and, in his typical fashion—he always worked en plein air, never in the studio, not even to finish a canvas—painted it right there on the beach. “I suffered horribly when I painted it,” Sorolla recalled. “I had to force myself all the time. I shall never paint such a subject again.” Appropriately, Sad Inheritance! was donated by a collector to a Roman Catholic church in New York in 1904. (It was deaccessioned in the 1980s and is now in Spain.) The chance to see it in San Diego is a rare one, explains Roxana Velasquez, the director of the San Diego Museum of Art, because the institution that owns it, the Fundación Bancaja in Valencia, generally does not lend it out. Before his final turn away from such material, Sorolla had painted three other canvases with painful or politically charged content, the most famous—and wrenching—of which is undoubtedly ¡Otra Margarita! (1892), also in the San Diego show. A somber canvas, it depicts a young woman in black, dejectedly sitting on a hard wooden bench in a dark train car that is empty except for two armed policemen standing behind her. A close look at her crossed wrists reveals that they are in handcuffs. This painting was also based on an actual incident, and the young woman is under arrest for killing her child. One might imagine that this kind of subject was too strong for 1890s taste, but ¡Otra Margarita! won the first-place medal at the International Exposition of Fine Arts in Madrid. Sorolla’s emergence into the light after the 1890s was also a move into modernity. After the catastrophe of 1898, Spanish writers and artists—the so-called Generation of ’98—set their sights on ushering their country into the 20th century and joining the rest of Western Europe. Sorolla’s bright and airy scenes connoted health, cleanliness, progress, and prosperity—all things that the new Spain promised. Sorolla’s Snapshot, Biarritz (1906), is typical in this respect—the artist has chosen to depict a modern young woman, sitting on a bluff above the beach, dressed in sanitary white and expertly manipulating a Kodak camera. His choice of portrait subjects, too—intellectuals such as the pioneering neuroscientist Santiago Ramón y Cajal and progressive politicians such as Aureliano de Beruete—reflect this desire to present Spain in a fresh light. 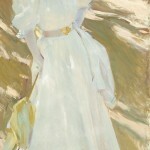 Ironically, though, Sorolla ended up dedicating much of his time from 1911 until 1919 to painting historical and even folkloric Spanish subjects, at the behest of his American friend and patron Archer Huntington. The adopted son of the railroad magnate Collis P. Huntington, he became infatuated with Spanish history and culture at the age of 12, when he read the English writer George Borrow’s 1841 book on the gypsies of Spain during a trip through Europe. Forgoing a business career, Huntington dedicated himself to educating Americans about Spain, with a particular emphasis on art, for which purpose he used his considerable inherited wealth to found and fund a museum, The Hispanic Society of America. Still housed in its original Beaux-Arts building in upper Manhattan. 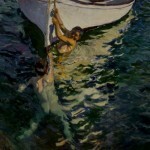 the HSA has one of the world’s biggest Sorolla collections and lent many works to the San Diego exhibition. The museum was the venue for Sorolla’s 1909 show, which was organized by Huntington himself. Huntington’s crowning glory as an art patron and Hispanicist was to be a series of connected paintings by Sorolla called A Vision of Spain that would be installed as a frieze running around the upper walls of the HSA’s central hall. (While the works cannot travel, oil sketches for them are included in the San Diego exhibition.) These huge compositions, such as the sweeping, five-panel Castilla (1913) and the riotously colorful Valencia (1916), are technical tours de force but lack the spontaneity and lightness of his earlier work. When they were finally installed after many delays, in 1926, critics were quick to point that out, and also to observe that the artist seemed to be unfamiliar with the conventions of mural painting. Sorolla’s critical reception and place in the popular mind have fluctuated over time. 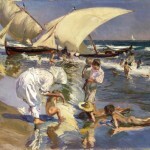 In his day, he was considered distinctly modern, partly for the cultural reasons mentioned previously and partly because of his compositional boldness and painterly brush handling, which was often called “sketchy.” One American critic went so far as to praise Sorolla as “an innovator, a scorner, a destroyer” who “mocks the rules of the game.” But the 1913 Armory Show and everything it brought with it presaged an eclipse for Sorolla’s sun. For decades, his work inevitably would look retrograde to many viewers, decorative at best, irrelevant at worst. “Obviously Sorolla was overshadowed by the new languages like Futurism,” says Velasquez, “and then for a while he was kept out in the cold. He was buried for most of 20th century, until a very recent revival.” In the 1990s, paintings of his began to appear in Sotheby’s and Christie’s auctions, according to Velasquez, and then a major show at the Prado in 2009 draw new attention to Sorolla’s work and place in art history. The current show, the principal curator of which is Blanca Pons-Sorolla, the artist’s great-granddaughter, is the biggest ever in the United States, even bigger—and of course broader—than the blockbusters of 1909 and 1911.